Major upsets were the order of the day as the pulsating Commonwealth netball competition reached its conclusion on the final day of the Games. Australia and New Zealand - the sport's traditional super powers - both lost their respective medal matches, but there was better news for the mighty All Black rugby sevens teams. Michael Shelley of Australia won the men's marathon, but the real story of that race was the collapse of Scottish athlete Callum Hawkins. Here we run through some of Sunday's biggest moments as the Games drew to a close. 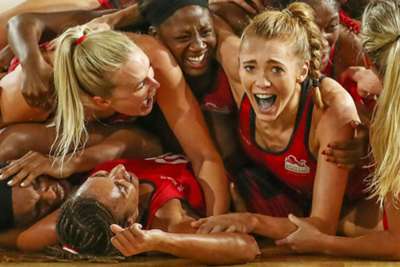 A day after their thrilling win over Jamaica in the semi-finals, England were at it again when they met the mighty Australia for gold on Sunday. Trailing 38-36 going into the final quarter, it took a Helen Housby goal after the siren to claim a historic title for the Roses, winning 52-51. And the Silver Ferns will return home empty-handed after losing the bronze medal match to Jamaica 60-55. Rugby sevens has been part of the Commonwealth schedule since 1998 and New Zealand have won five of the six gold medals on offer. They lost out to South Africa in Glasgow four years ago, but normal service was resumed on Sunday as the All Blacks thumped Fiji 14-0 in the men's final, while the inaugural women's competition was also won by New Zealand courtesy of a 17-12 golden point extra-time victory against Australia. "It's so surreal, I can't believe I just won the gold medal," said New Zealand captain Sarah Goss. "I'm so proud of all the girls, it's been an amazing run over the last eight weeks. Your Commonwealth Games Sevens Gold Medalists. The collapse of Hawkins cast a shadow over Sunday's marathon races. Leading the men's event with a mile to go, Hawkins began weaving before falling over a kerb and appeared in significant distress. The 25-year-old briefly got back to his feet to continue, but he soon collapsed once more and the time it took medical staff to attend has drawn widespread criticism. Team Scotland later revealed Hawkins was sitting up and speaking with family and medical staff.